Did you know that July is Lakes Appreciation Month? Hopefully you will take some time to enjoy a lake this month through swimming, boating, fishing, hiking, painting, or photography. There are over 8,000 lakes in Washington, over 1,400 lakes in Oregon, and over 3,000 lakes in Montana to choose from! The scientists and engineers that support Herrera’s Aquatic Ecology Projects have been hard at work this year addressing lake management issues such as toxic algae blooms and invasive species. 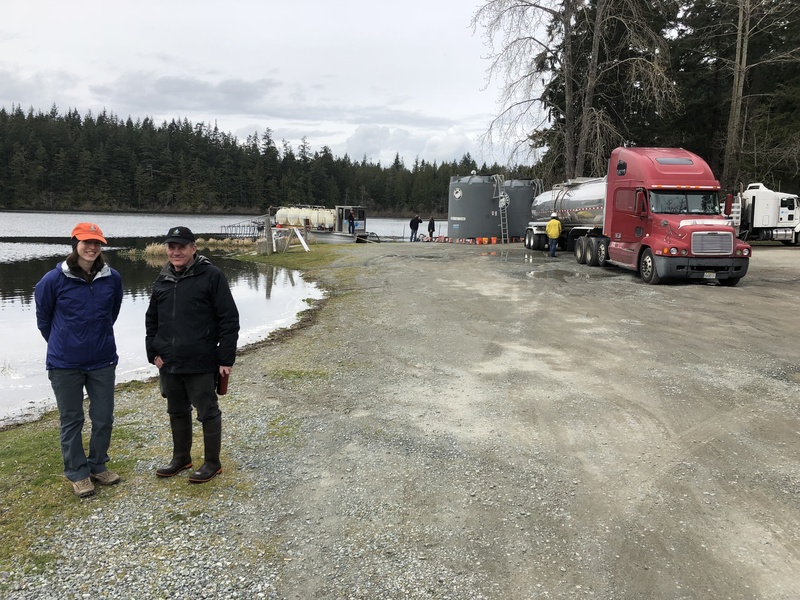 Two recent projects include the Heart Lake Alum Treatment in Anacortes, Washington and invasive plant surveys in Lake Goodwin and Lake Shoecraft in Snohomish County. Heart Lake is a 64-acre eutrophic lake located two miles south of the City of Anacortes located in a forested watershed managed by the City of Anacortes Parks Department. Herrera worked with the Parks Department to select the best option to address recurring algae blooms that resulted in lake closures during the summers of 2012, 2013, and 2014. The selected alternative was treating the lake with aluminum sulfate (alum). Herrera coordinated with HAB Aquatics Solutions on the alum application that took place over a 2-day period in April 2018. Students from Anacortes High School captured this drone footage during the alum application. Unique aspects related to this alum treatment included adjustments to accommodate a population of rough-skinned newts, coordination with Washington Department of Fish and Wildlife regarding stocking dates for rainbow trout, and measurements of high pH and oxygen saturation levels prior to the start of the treatment. Herrera coordinated with Western Washington University on monitoring prior to the treatment, during treatment, and post-treatment. The Secchi depth in the lake prior to the alum treatment ranged from 1.5 to 2.5 meters with a summer mean of 2.0 meters. Although the post-treatment data is still being collected, Secchi depths have improved to over 5 meters and no adverse effects have been observed on the rough-skinned newt population. Rob Zisette and Rebecca Dugopolski prepare for the alum treatment at Heart Lake. Herrera also recently wrapped up six days of invasive plant surveys in Snohomish County. Herrera divers performed surveys with the aid of underwater scooters along the shores of Lake Goodwin and Lake Shoecraft. 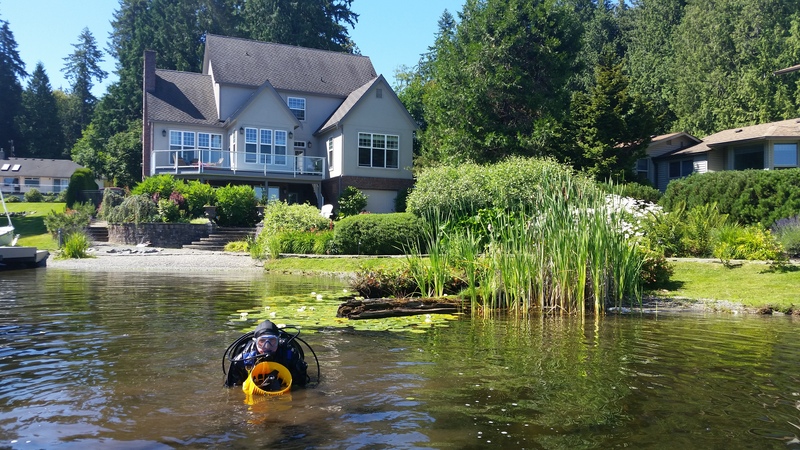 Supported and directed by Snohomish County Surface Water Management staff, Herrera divers located and removed over 100 pounds of Eurasian watermilfoil plants from the lakes by carefully handpulling the entire plant, including all roots and fragments to prevent re-growth. The surveys focused on portions of the shoreline where sparse growth of the invasive plant is anticipated to occur in an effort to reduce plant coverage and the size of dense plant growth areas requiring herbicide treatment in the future. Rob Zisette performing an invasive plant survey with the aid of an underwater scooter.